The femoroacetabular is one of the largest, strongest and most flexible joints in the human body. During gait our hips give us power and stability, and when jumping, these ball-and-socket joints are able to withstand enormous impact. Yet the hips and their supporting structures often take a beating due to aging, overuse, and trauma causing the brain to reactively guard the area with spasm or pain. For decades, lateral hip pain has been blamed on injury to the fluid-filled bursa sacs covering the greater trochanter, thus the name trochanteric bursitis (TB). 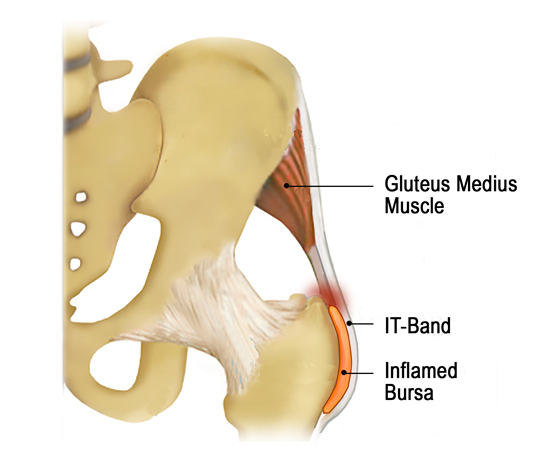 Yet, today many of us have come to realize that many cases of hip “bursitis” are actually due to wear and tear of the gluteus medius/minimus tendons beneath the bursa and/or IT-band irritation overlying it (Figure 1). Pain and hip instability do to abductor and IT-band tendinopathies may cause the client to walk or run with poor control, which, in turn, creates friction and irritation of the trochanteric bursa. Researchers Thomas Bunker, et al were the first to compare this condition to “rotator cuff” bursitis, where the subacromial bursa becomes inflamed and irritated secondary to underlying rotator cuff tendinopathy.1 He and others have called the gluteus medius and minimus tendons the “rotator cuff of the hip.” In this newsletter, I will use the term greater trochanteric pain syndrome (GTPS) to describe this condition since it includes three possible injury sites affecting the lateral hip. GTPS can result from direct impact to the lateral hip, prolonged single-legged weight bearing, instability due to aging, sports injuries, and IT-band bursa irritation from repetitive movements. Clients usually present with dull lateral hip pain sometimes radiating into the thigh. It’s not uncommon for clients to report that their pain worsens at night and when rising from a chair after having been seated for an extended period of time. During GTPS assessment, the client’s pain may be aggravated by direct palpatory trochanter pressure, single-legged weight bearing (30-seconds), and resisted hip abduction. Yet, I’ve found the hip de-rotation test demonstrated in Figure 2 to be the most effective. Figure 2. In this hip de-rotation test for GTPS, therapist flexes client’s hip and knee to 90-90 and slowly abducts and internally rotates the femur to barrier. Client is asked to push her foot against therapist’s hand (external femoral rotation). If lateral hip discomfort is reported, therapist records this pain provocation test as a positive. If the assessments point to GTPS, the treatment goals are to increase blood flow and hydration to the area while restoring elasticity to the tissues that may be compressing the bursa against the greater trochanter. Since many GTPS clients experience stiffness and restricted ROM on the affected side, restoring normal hip ROM can be achieved using graded exposure stretching as demonstrated in Figure 3. To relieve IT-band pressure on the bursa, I like to apply slow sustained elbow pressure to the tensor fascia lata while the client performs slow pelvic tilts (see accompanying video). These techniques can also be aimed at decreasing length deficits of the glutei, hamstrings, quadriceps and piriformis. Home retraining advice should focus on strengthening the hip abductors, external rotators and extensor. This combo will help improve the client’s gait deficits, hip biomechanics and pelvic stability. Figure 3. Therapist discovers an abduction/internal rotation restriction while performing a Faber Test and applies a graded exposure stretch to enhance femoroacetabular range of motion. In chronic cases, the client must understand that the pain is not pathologic and that, in time it will resolve itself… with or without therapy. To help lower the client’s threat level, encourage them to have peace with their pain during the therapy process. Assure them that by working as a team, the painful condition will be resolved.